I love chocolate. My dad loves chocolate. 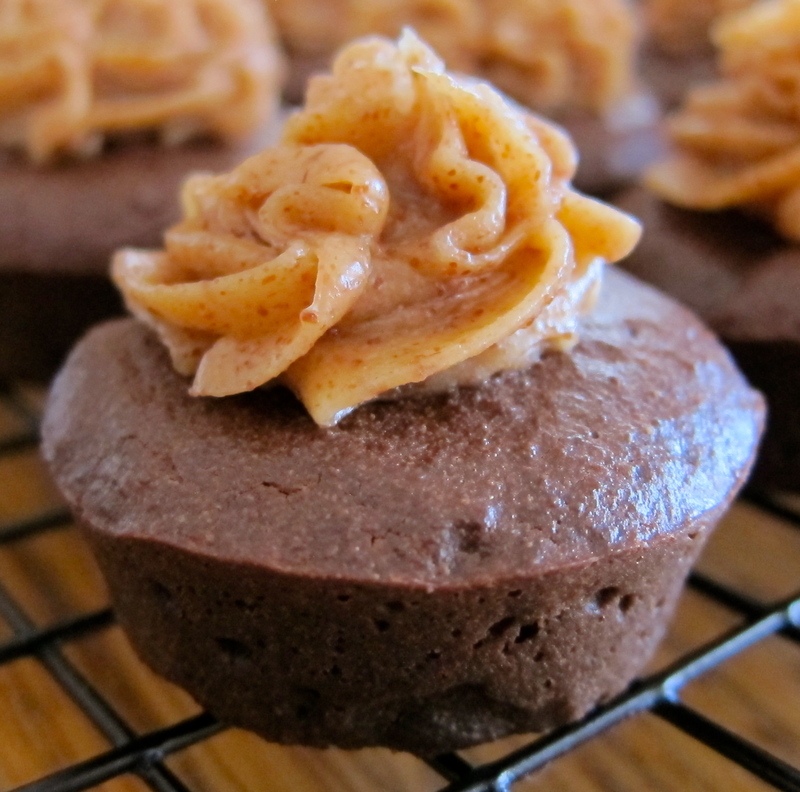 We both admittedly have a little problem with chocolate portion control…so we love any recipe for a treat that is small and bite-sized (and therefore “naturally” portion controlled) but still packs a satisfying punch! This year for Father’s Day I made a variation of this recipe from All Day I Dream About Food and it was a huge hit. It’s rich and chocolatey and one (ok, maybe two) will satisfy even the biggest sweet tooth. We have had an unusual few weeks here in Colorado Springs with the Waldo Canyon Fire and my parents have been staying with me due to the evacuations…we decided we needed a sweet treat and these babies fit the bill perfectly…we could enjoy without over-indulging! Now, when I say “naturally” portion-controlled…that statement can only be true if you don’t eat all of them in one sitting…I’m proud to say that I made these on June 30th and we still have four in the fridge! For the cakes, preheat the oven to 280F and grease 16 cups of a mini-muffin pan. In a medium saucepan, melt butter, almond butter and chocolate together over low heat and stir until smooth. Add stevia and vanilla extracts and stir until thoroughly combined. Set aside. In a medium bowl, sift together coconut flour, coconut palm sugar and cocoa, breaking up clumps with the back of a fork. Add the chocolate mixture and stir to combine (will be very thick). Stir in eggs, one at a time, and then coconut milk until mixture thins out somewhat and becomes a smooth batter. Spoon batter into prepared muffin tins. Because the batter is quite thick, you will need to press the batter into the cups using the back of a spoon. Smooth the tops. Bake for 20 minutes, until the cakes are just set and the middle is firm to the touch. Allow to cool in the tins. For the frosting, beat cream cheese, almond butter and cream together until smooth. Stir in vanilla and stevia. 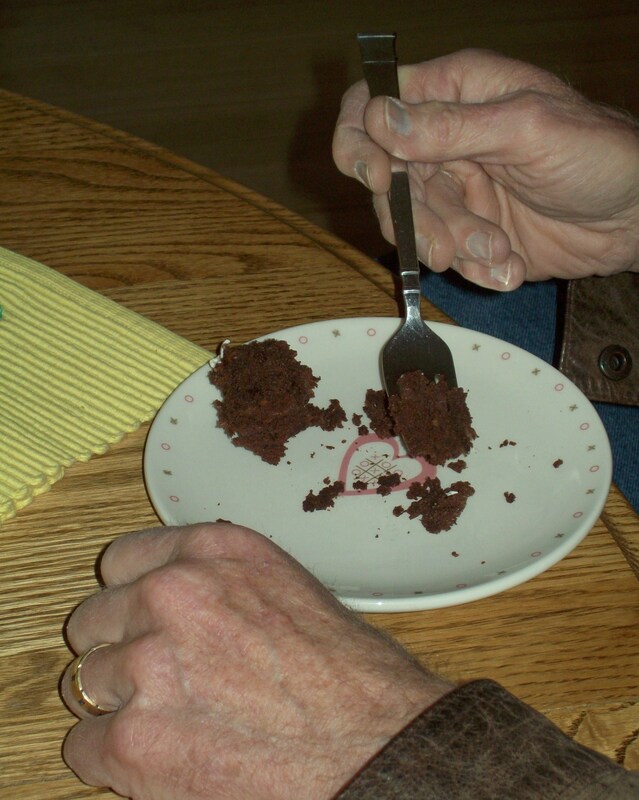 Pipe or spread onto brownie bites. 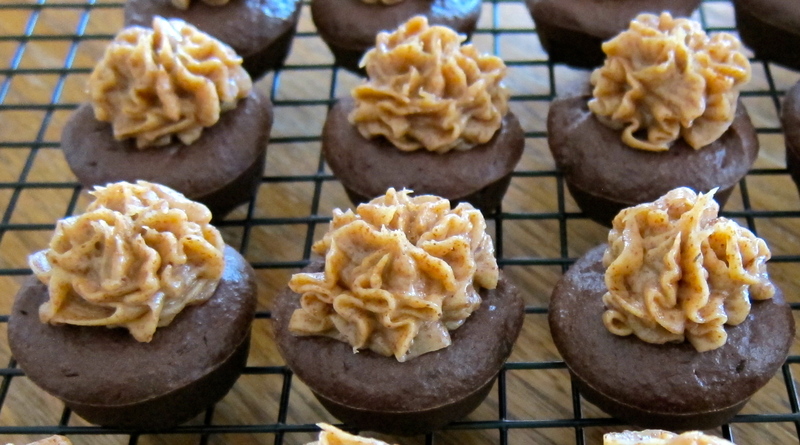 Generally, my dessert of choice includes some sort of chocolate but as we are coming into warmer weather here in Colorado I am really enjoying the light texture and fresh taste of these Mini Ricotta Cheesecakes. 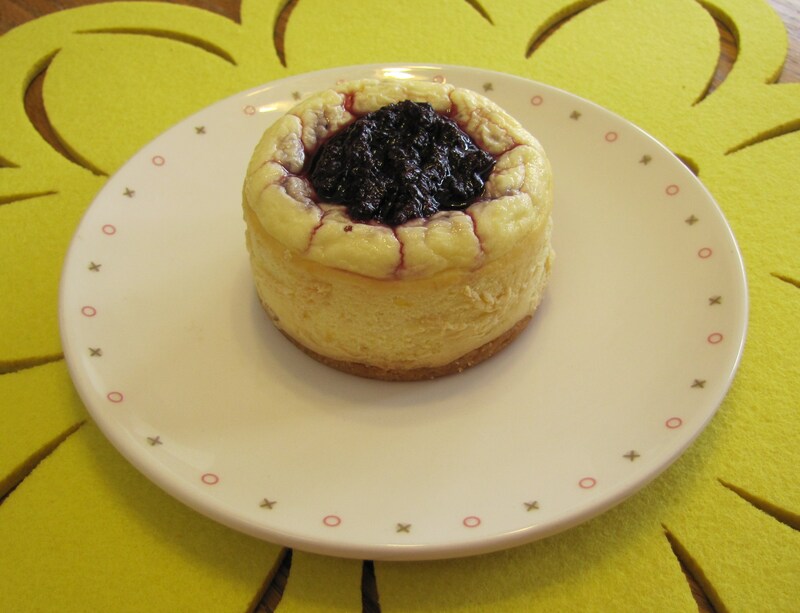 I have made them twice now, once as plain cheesecake with cherry topping and these pictured here with lemon zest and blueberry puree…both are equally delicious! 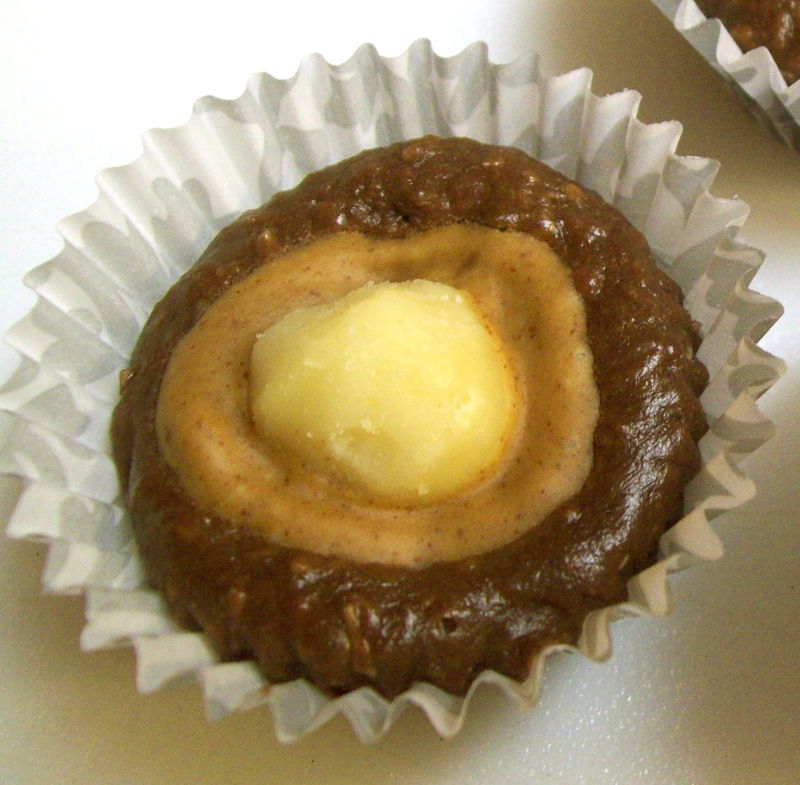 I love that they are grain-free and stevia sweetened, making them a very low carb, low glycemic, guilt free treat. The recipe is super easy and can be adapted to just about any flavor of cheesecake…chocolate with raspberry sauce will be my next creation, of course. This recipe will make six mini-cheesecakes. I use a mini-cheesecake pan with removable bottoms but you can also use a standard muffin pan lined with paper and foil muffin liners for easy removal. I use full-fat dairy products but you could substitute low or reduced fat dairy for an ever lower calorie treat. Also, make sure your ingredients are at room temperature before combining for an evenly blended batter. Preheat oven to 325 F. Line six muffin cups with paper and foil liners. Combine almond flour, melted butter, stevia and vanilla until mixture holds together, divide evenly between muffin or mini-cheesecake cups and press into the bottom. Bake for 10 minutes or until slightly golden, remove and cool. Meanwhile, in an electric mixer at medium speed, beat cream cheese and stevia until blended. Beat in ricotta, egg, vanilla and lemon zest, if using. 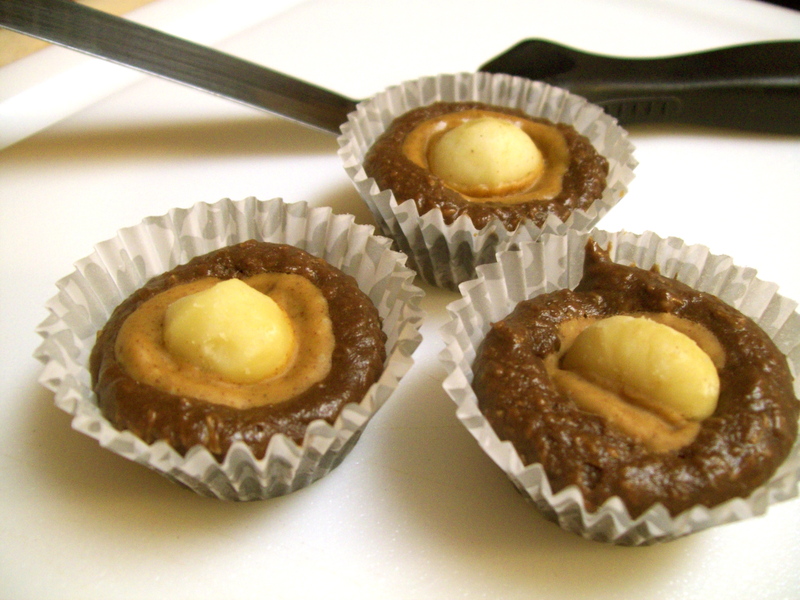 Pour filling into prepared muffin or mini-cheesecake cups. Bake 15 minutes, or until almost fully set. In a food processor, puree blueberries for 30 seconds, whisk in liquid stevia and set aside. Remove cheesecakes and let cool completely on wire rack. Refrigerate one hour or wrap in plastic and refrigerate overnight. Serve chilled or at room temperature topped with blueberry puree. I love dessert, I eat it everyday at around 3 o’clock in the afternoon, it’s the best part of my day. Most days it’s just berries and whipped cream or yogurt, an apple with almond butter or a frozen smoothie, but several times a month I like to make something really decadent. I am always on the lookout for gluten, grain, refined sugar and especially GUILT free healthy options for my special treat days. 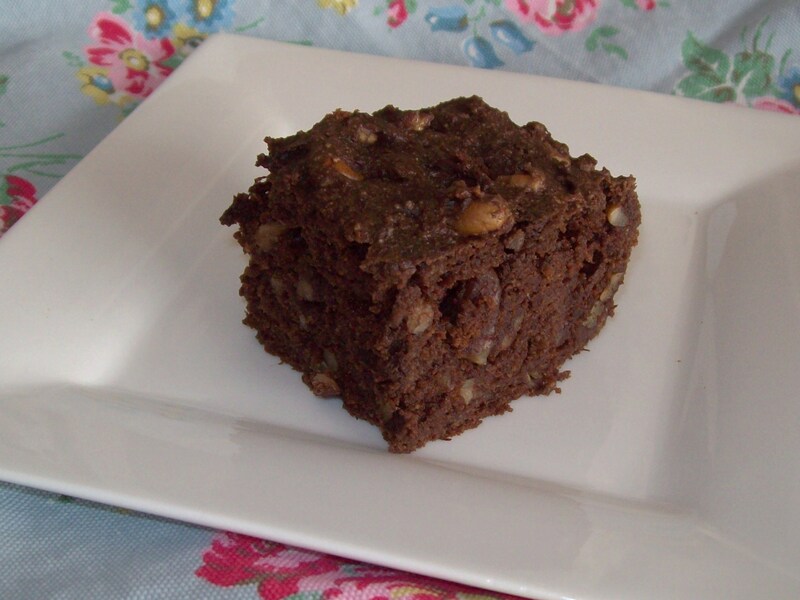 Yesterday I came across a wonderful recipe for Carob-Banana Bars at The Whole Life Nutrition Kitchen website, I could hardly wait to make these today…I have made a few alterations to the original recipe to include cacao powder rather than carob and added walnuts for some extra texture, it came out perfect! 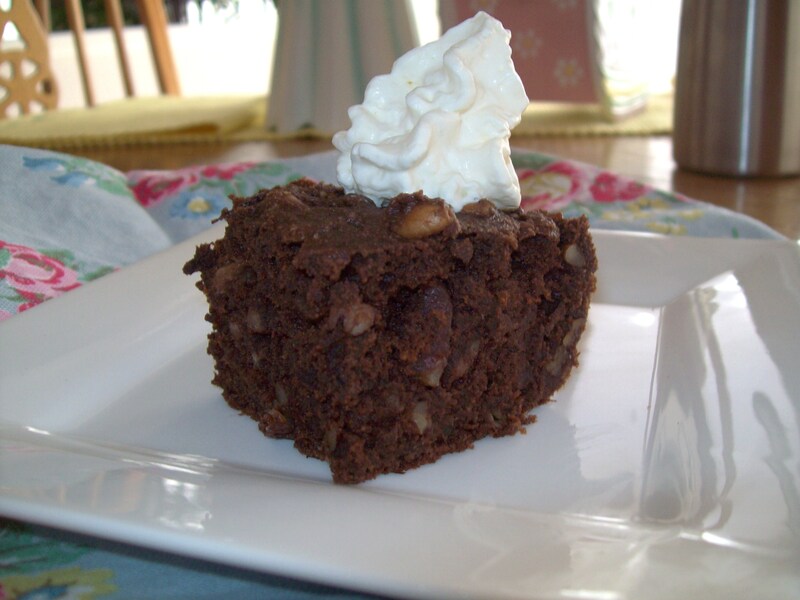 I will try this recipe with carob powder sometime as I really do like the taste of carob…I was just out of it today and didn’t want to make an extra trip to the store since I had everything else. My dad is coming over today so I am excited to see if he likes it…he loves dessert as much as I do so I’m sure he will! Make sure all ingredients are room temperature (even the eggs) otherwise they will cause the coconut oil to harden. Use slightly over-ripe bananas for a sweeter cake. If you choose to use the carob powder rather than the cacao powder the additional sweetener isn’t necessary, stevia can sometimes have a bitter taste so you may add the 1/4 cup palm sugar instead of the extra plain stevia listed in the recipe below. Preheat oven to 350 degrees F. Oil an 8 x 8-inch glass baking dish with coconut oil. Mix together the dry ingredients in a medium-sized mixing bowl. Use your fingers to break up any clumps in the almond flour. Then whisk the ingredients together. Set aside. In a small bowl, add the bananas and mash with a fork. Measure the mashed bananas to make sure they are just over 1 cup. Add more banana if needed or remove some. Then add the remaining ingredients and stir together with the fork. Add the wet ingredients to the dry and whisk together. Pour into the prepared baking dish. Bake for approximately 30 minutes or until toothpick inserted in center comes out clean. Let cool before cutting into bars. Serve with a dollop of fresh whipped cream or glass of ice-cold almond milk. Enjoy!